Concrete floor sealers are a one-step, quick way to tackle multiple problems with renovated, rejuvenated or freshly laid interior concrete flooring. This covers new builds – in retail and commercial properties – and renovated properties inclusive of restaurants, garages, boutiques, showrooms, factory warehouses, loading in bays of supermarkets, and manufacturing plants. As you would imagine from the scope of property projects that would benefit from a concrete floor sealer, it does hang on using the right floor sealer and not simply the first one to hand. If you are unsure as to which floor sealer to use for a concrete floor to waterproof it, control and eliminate dust build-up, protect it from oil and chemical spills, impact, scuffs, stains, abrasions and discolouration, this guide is for you. Browsing on your phone? Check the full range here. There are new products available from Hydron, Britannia and Resin Surfaces Limited. How do I apply a floor sealer? Is there a difference between decorative concrete floor sealers and protective ones? Is a floor sealer the same as a floor paint? Can floor sealers be used as part of decorative rejuvenation work? Are toxics and VOCs hazardous to breathe in when applying floor sealers? How can I make sure I get the correct floor sheen finish? How long will a sealer protect my concrete flooring? Which sealer should I use for light to medium vehicular traffic? Which floor sealer is best for muddy pedestrian traffic? Can I apply a floor sealer in one coat? Can I pick a floor sealer colour, or will it just be a clear coating? What is the typical meter squared coverage on a concrete floor? Do I need a specialist floor sealer to treat existing damp problems? Are concrete floor sealers anti-slip coatings? Can I seal over cracks in concrete, or should I repair them first? Will I need a specific floor sealer for external concrete – patios, driveways, paths and walls? What is the best sealer for power floated concrete floors? What is the best floor sealer for screeded concrete surfaces? Pour the concrete sealer into a suitable application tray or in certain instances directly onto the floor and apply the sealer evenly across the floor using a brush, roller, squeegee or spray dependent upon product instructions. Allow the sealer to cure before trafficking and replacing equipment and machinery. Concrete floor sealers are clear, and certain products may be used on dyed or stained concrete floors to protect the underlying decorations. Polished concrete can be a central focus point in many public establishments – inclusive of museums, art galleries and lavish hotel lobbies – and any but a clear concrete sealer could spoil the intricate detail. Please check the datasheet of the sealer to ensure its compatibility with the decorative concrete surface it is being applied to. No. Floor paints are available in a wide range of colours and sheens, whereas floor sealers are used to bind and seal the surface. Most floor sealers can be painted over, or left as a finish if desired. There is a wide range of floor sealers dependant on your budget – starting with 314 Clear Floor Sealer, which is a cost-effective product which can also be used on wood or metal. High quality floor sealers will not yellow. Yes, floor sealers can protect intricate décor on listed buildings which may be open to the public for display – protecting it from footfall wear and tear. Are VOCs hazardous to breathe in when applying floor sealers? Yes, epoxy and solvent based floor sealers can contain hazardous levels of VOCs, and all persons using and around the work environment should use personal protection equipment, and areas kept well ventilated. Some products are professional use only and relevant product data sheets should always be referred to before use. For water-based floor sealers, Rust-Oleum 5220 Epoxyshield Sealer reduces dust production and is touch dry in just one hour. If you are unsure as to the suitability of a floor sealer for your project, please contact Rawlins Paints’ technical support team who will be able to make sure you pick the correct low or high sheen product. This will depend on the environment. For atmospheric environments, Jotun have some excellent floor sealers, including Jotun Penguard Clear Sealer, a two component and transparent polyamide cured high molecular weight epoxy sealer, which can be used as a primer, or finish coat in a new flooring system. Concrete floors which may undergo extreme stress from heavy vehicular action, inclusive of aircraft hangers, would be better suited to the long-term protection of Jotun Jotafloor Sealer. Areas which are undergoing a full floor installation, including an epoxy paint system for extra durability, may require Coo-Var Two Pack High Performance Primer. Concrete is a tough and durable material, but under duress from vehicular – and even pedestrian – traffic, it can generate excessive dust from being untreated. Even brushing down concrete dust can generate more dust! Moisture can easily be absorbed by untreated and porous concrete, meaning that oil, fats and grease can quickly stain and discolour it. A suitable sealer will waterproof and protect the concrete, allowing for quick and easy cleaning. For areas where vehicles are used internally and externally, a hydrophobic surface resistance to water, chemicals and oils is vital. Sikafloor ProSeal 90 is a one component product with a higher efficiency curing, sealing and hardening liquid for interior and exterior use where vehicular activity will regularly be undertaken. Rawlins Paints distribute many Sikafloor concrete sealers for next day delivery, each with different heavy duty and durable capacities dependant on the environment and load expectation. 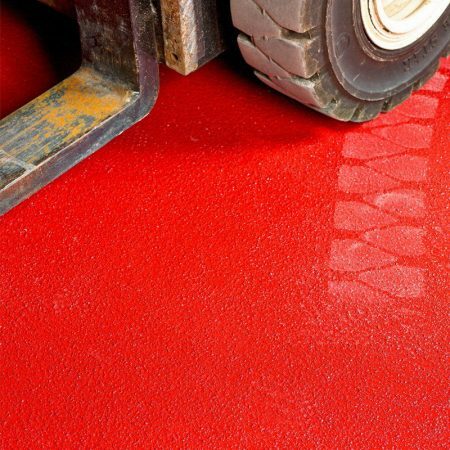 From this selection, Sikafloor 11 Pronto is a two-part, medium viscosity and fast curing primer for car-parks and industrial floor purposes, where transportation equipment will be used. Ideal for workshops, walkways and production areas where conventional surface preparation is not possible, Sikafloor Resiplot is a high-end floor system for concrete. For areas where pedestrian traffic in autumn and winter months can generate a lot of mess, with mud, snow and water being brought in, a durable floor cleaner will be required that can meet the expectations of light vehicular action from industrial floor cleaners. Supermarket loading-in areas are a typical example of where externally exposed pedestrian areas may require a heavier duty floor sealer. For small floor areas, try Rust-Oleum 5401 Epoxy Impregnation Primer – which can be used under other Rust-Oleum floor paints for a striking floor finish in public facing areas. Alternately. Try Sikafloor 2540W, again for porous areas of concrete not requiring large scale renovation or installation work. 305 HD Clear Sealer is a heavier duty concrete floor sealer which cures quickly and is chemically resistant to work well in conjunction with rigorous cleaning products. Concrete floor sealers are generally clear in finish, but do offer low and high sheen options. Please refer to each products’ datasheet to check its typical floor coverage ratio. There are environmental and humidity levels to consider when measuring up square meter from usage, too. Some locations may require a low temperature floor sealer, others a rapid cure one for minimal downtime. There are specialist floor primers and sealers to tackle underlying damp issues a concrete floor may have, inclusive of 402 Damp Proof Coating, which can be applied as two coats for areas of increased sub-floor dampness. No, floor sealers are not specifically designed to be anti-slip, and if a concrete surface does get wet or greasy, it can still be slippery. It is best to use a specialist anti-slip floor paint system to ensure that your concrete floor meets anti-slip health and safety requirements. All cracks, gaps, holes, divots and crevices must be repaired first. A floor sealer cannot fully protect damaged areas from further impact damage if they are left vulnerable and unrepaired – even small cracks can elevate in severity under pressure if untreated. There are floor sealers available for interior and exterior use – including for stone and brick, as well as concrete and cement. Thermilate PRO Drive Block Paving Sealer is a high quality and clear sealer suitable for most types of block and cobble paving. Power floated concrete floors are polished by machine before the concrete cures – producing a dense, smooth and glossy surface finish. These types of concrete floor if allowed to cure will need to be etched or sandblasted prior to the use of a sealer or paint coating. Sika offer a range of ‘Proseal’ sealers available for use as the power float floor is laid. Screed concrete floors are applied on top of concrete slabs to level a surface. Due to the method of application, screeded concrete is usually rougher and more heavily textured, leaving it more porous. Screeded concrete floors should be mechanically abraded to remove laitance and salts, enabled better adhesion of floor paints and sealers. If you have any further questions about concrete floor sealers, please leave a question in the comments section, or contact us at Rawlins Paints via phone/email. We have sealed a concrete floor with PVA. What is now the best floor paint to use. Apologies for the delay in getting back to you. We would need to know what the floor was first of all, i.e. garage, warehouse, carpark, etc. and whether it’s an internal/external floor, and what level of traffic it would be receiving. If you could let me know, I’ll get straight back to you with a floor paint recommendation.